After judge's contempt threat, Trump admin. returns deported mom, child to U.S.
'I'm going to start with the attorney general,' a federal judge said, threatening charges against Jeff Sessions over the deportations. Carmen was on her way back to her estranged husband's sexual and physical abuse, and to the fear that she could once again be a violent gang's prey, when a federal judge, outraged that she had been spirited from the country by the U.S. government, ordered that she be returned. 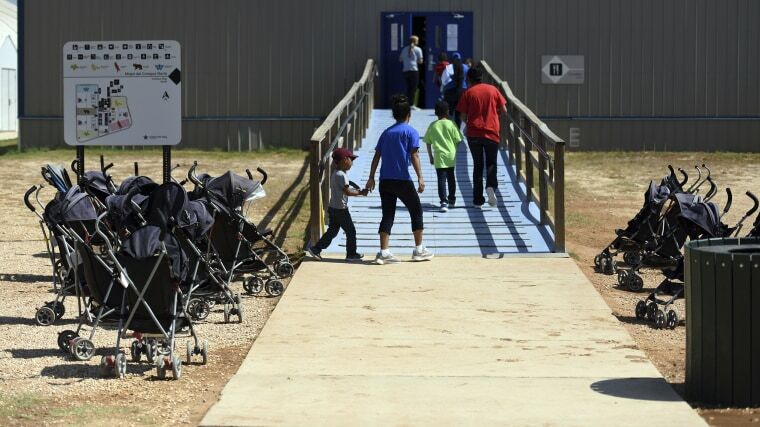 By Friday morning, Carmen — not the woman's real name — was back in the South Texas Family Detention Center in Dilley, the place she had left with her daughter before they were put on a plane to El Salvador. They might have been forced to face the dangers they had fled had Judge Emmet G. Sullivan of the U.S. District for the District of Columbia not learned of their deportation. He was told of their removal while he was considering whether to keep the government from deporting plaintiffs in a lawsuit challenging new Trump administration rules that prevent people like Carmen from qualifying for asylum in the U.S.
“Somebody in pursuit of justice who has alleged a credible fear in her mind and is seeking justice in the United States court is just — is spirited away while her attorneys are arguing for justice for her? It’s outrageous," Sullivan said after learning of Carmen and her daughter's deportation, according to a transcript of the hearing. Sullivan was so upset by Carmen and her daughter's deportation that he was ready to haul Attorney General Jeff Sessions, Homeland Security Secretary Kirstjen Nielsen and the heads of U.S. Citizenship and Immigration Services and the Executive Office of Immigration Review into court so they could explain to him why he shouldn't charge them with contempt of court. To emphasize his seriousness about the contempt threat, Sullivan followed it up with a written order. Citing pending litigation, DHS declined to comment about why the mother and child were deported despite assurances from a government attorney that plaintiffs in the lawsuit Sullivan was hearing — which included Carmen and her daughter — would not be deported. DHS also declined comment on whether the deportation was under investigation or if anyone had been disciplined. Sullivan ordered that "the circumstances surrounding the removal of plaintiffs" be explained in writing by 5 p.m. Monday and demanded that the explanation include material from "appropriate officials." The Trump administration has been under increasing pressure from federal judges as legal challenges have been filed against President Donald Trump's immigration policies — from separating 2,551 children from parents at the border to ending an Obama-era program known as DACA. At issue in Carmen's case is Sessions' order making domestic and gang violence no longer grounds for seeking asylum in the U.S.
People who request asylum at the border go through a screening to determine if the fear that they will be persecuted, harmed or killed if returned to their country is credible. "What we've been seeing is claims that should pass this credible fear interview or border screening are being denied" based on Sessions' new order, said Eunice Lee, co-legal director at the Center for Gender & Refugee Studies at UC Hastings College of Law, which filed the lawsuit with the ACLU. The lawsuit states that Carmen had endured two decades of “horrific sexual abuse by her husband, who routinely raped, stalked and threatened her, even after they were living apart." He treated her as property, the lawsuit states. Carmen didn't report her husband's threats to police because she had not seen the police protect other women from their husbands' abuse and had heard that women were killed by their husbands after reporting them, the ACLU complaint states. Carmen had a good factory job in El Salvador, but that made her and her daughter a target for gangs. Four or five of her co-workers were killed by the same gang in the past year. "They held her up at gunpoint in May 2018 when she was on her way home from work and demanded that she pay a monthly 'tax,' making it clear that they would kill her and her little girl if she did not comply," the complaint states. Carmen and her daughter sought asylum in June. The lawsuit states she and her daughter were found to have testified credibly, but did not pass their interviews with an asylum officer who determines whether people meet the U.S. government's credible fear standards and can continue through the asylum process. As is usually done in asylum cases, an immigration judge reviewed Carmen's case, but did not overturn the asylum officer's rejection of her claim. "The point of the interview is to allow all meritorious claims to get into the system for people to have their day in immigration court, not to screen out any claims that would win before an immigration judge," Lee said. Separately, a judge in San Diego is hearing another lawsuit regarding the administration's separation of children from their parents. In that case, ACLU attorneys are arguing that parents should be given a chance to stay in the country because many of them signed documents agreeing to their deportation because immigration officials gave them forms to sign that were in English or because they believed it was the only way to get to see their children.